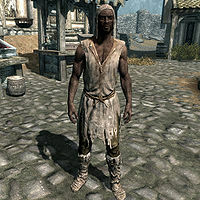 Brenuin is a Redguard beggar and drunkard living in the city of Whiterun. He wants someone to steal a rare Argonian ale from The Bannered Mare, the local inn. He offers a healing potion in return. Brenuin can't afford a place to sleep so he wanders around town all night long, from 1am to 9am, begging for coins and food. When the sun rises he heads to the Gildergreen and spends five hours listening to Heimskr's ramblings. At 2pm he walks down to the market in the Plains District and spends his afternoon trying to get some free food from either Ysolda, Anoriath or Carlotta Valentia. At 7pm he enters the Bannered Mare where he strolls around the taproom until he hits the streets again at 1am. The only exception to this routine occurs when Jorrvaskr is attacked by the Silver Hand at the end of the quest Blood's Honor. Brenuin will then be in the crowd gathered outside Jorrvaskr. He wears a set of ragged robes with boots and a cap. He only carries a small selection of lower-class items and gold. When passing by he will usually remark "I ain't done nothin'." and "What? Why you lookin' at me?" He will also reveal his true opinion on local preacher Heimskr: "That Heimskr's crazy. Him and his talk o' Talos. Wish he'd just shut up." To initiate his quest, Argonian Ale Extraction, you must ask him, "Are you always drunk?" "Only if I can help it. But damn if I ain't almost sober. Hey. In the Bannered Mare, there's this bottle of Argonian Ale. The good stuff. Get it for me. They won't even know it's gone. Come on...", to which you can reply, "I'll bring you that ale, old man." and see him get excited: "Argonian Ale! I can almost taste it! ", if you ask him again before you have the ale he will state, "Well that all depends on you, now. Doesn't it?" and when you retrieve the ale, "Here's that special ale you wanted. ", to which he replies, "Well, would you look at that! Argonian Ale! My thanks, friend. Here, take this here healing potion. I, er, "found" it in the temple." Afterwards you may ask him "Still thirsty?" which results in "Not anymore. Thanks to you. Friend". Alternatively when he asks you to get the ale you can tell him, "I'm not going to feed your bad habit. ", to which he displays his annoyance "Then we got nothin' more to talk about". Asking Lucia why she is begging will reveal that Brenuin has a soft side for the orphan, and has been giving her some advice since she came to the city: "It's... it's what Brenuin said I should do. He's the only one that's been nice to me since... since mama..."
Anoriath: "I don't suppose you're going to buy something this time?" Brenuin: "Just browsin' today. If the gods be kind, someone will take mercy on me and spare a few septims." Anoriath: "If they do, promise you'll actually purchase something for once." Brenuin: "By Ysmir, I will. Gods know it's been too long since I tasted real meat."